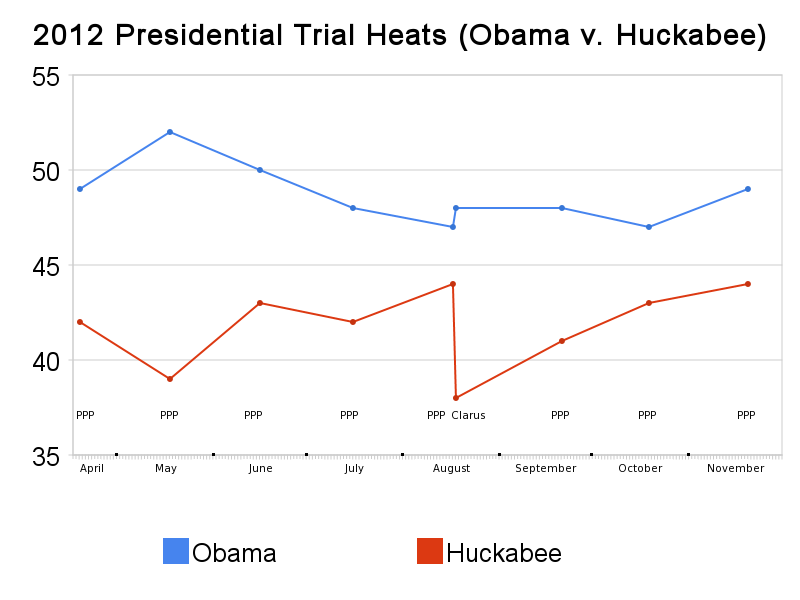 Either the Republican Party is quieter about their efforts at tinkering with their presidential nomination rules for 2012 or FHQ just doesn't have the right connections. We do have one that is consistently good, however. According to former Michigan Republican Party chair and TDSC member, Saul Anuzis, the group is meeting today in Washington. The group last met at the end of September. Very little information has emerged from any of the meetings thus far. Iowa and New Hampshire are safe in their first-in-the-nation status and there has been at least some discussion of regional primaries, and separately, a potential instant runoff system. FHQ will update as news of the meeting surfaces. In the meantime, both Anuzi's Twitter account and blog are good places to check if you're impatient (...like FHQ). A month and a half ago, FHQ posted a link to and discussed a presidential election forecasting model built on candidate biographical information. The benefit of this model -- and it performs quite well stacked up against other forecasting models -- is that the biographical data exists now. In other words, you don't have to wait until the second quarter economic numbers are released or to wait on polling data from a particular period of time in the election year to put an accurate forecast together. [But hey, if you want to continue to come here and watch FHQ wade through the quadrennial polling data on the presidential race, we won't fault you. We here at FHQ may go so far as to encourage it.] 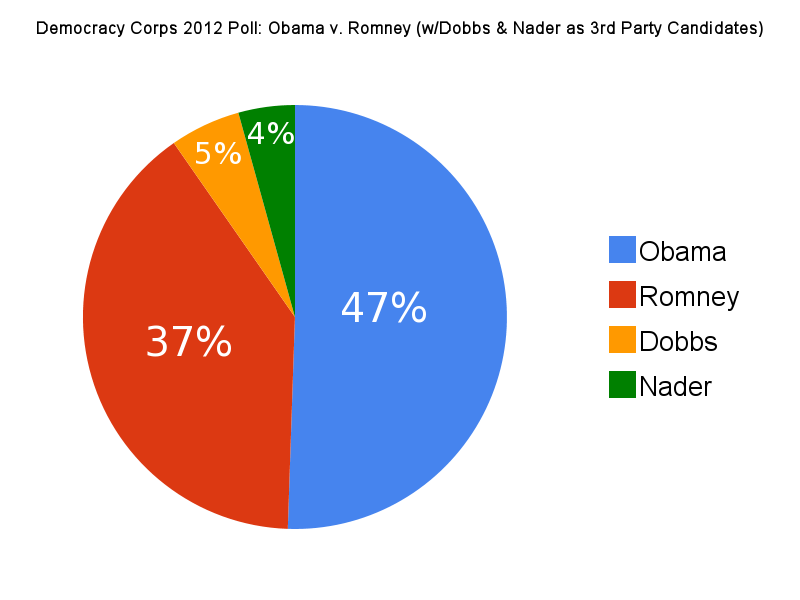 I left off in that post urging folks to start scouring the biographical data on the prospective 2012 Republicans. But why do that? Well, if you're patient, you'll be pleasantly surprised by an email from the authors of the original research. 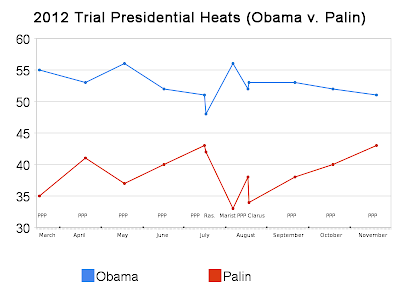 And lo and behold, one of those co-authors, Andreas Graefe (the other is J. Scott Armstrong), emailed me this morning to inform me that -- yes, that's right -- they've already looked at the Obama v. Palin numbers. How does Palin fare against the President? 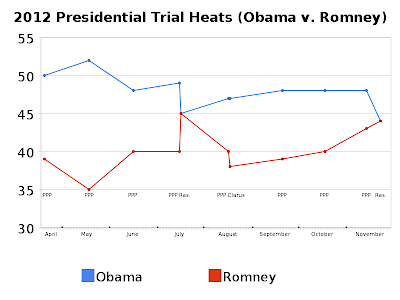 That nine point difference between the two candidates' biographical indicators translates to Obama carrying a 59.6% share of the two-party vote in 2012 if this was the match up (For some context, Obama received 52.9% of the vote in 2008 or 53.4% of the two-party vote). 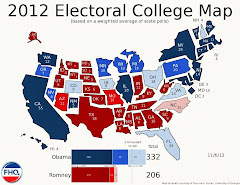 That's Reagan-Mondale territory and would likely make for quite the electoral college sweep for Obama. But didn't you say that this model wasn't particularly adept at picking elections involving incumbents? (Ah, you followed the link and read the previous post, didn't you? Thanks.) That's right. 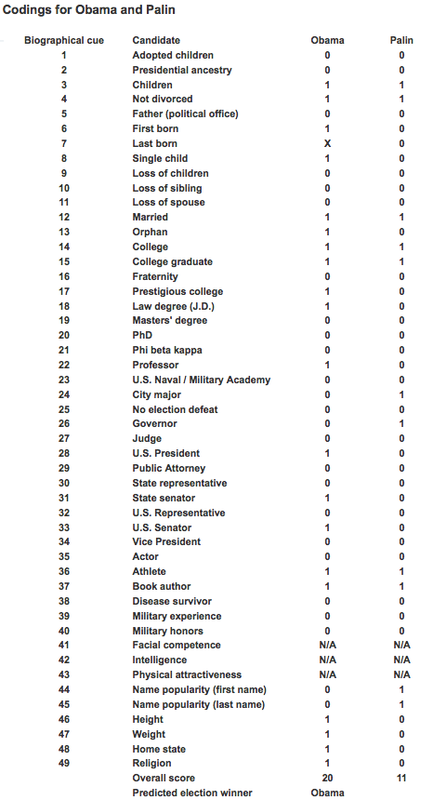 Three incumbents with biographical score advantages lost re-election bids (to: Truman '48, Carter '76, Clinton '92). It has been done, then, but let's look a little more closely at those three elections. 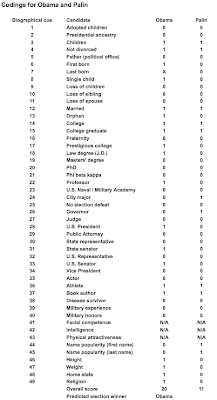 Carter and Truman had deficits of 5 points on the biographical index while Clinton trailed Bush by just three points. Palin's disadvantage against Obama is over twice the average deficit across those three incorrectly predicted elections, though. That's a real hole to be in even before you start considering running for president. But back to my question from the last post: Who among the 2012ers does the best? A special thanks to Andreas Graefe for drawing our attention to the updated 2012 outlook. Back in July Public Policy Polling conducted a survey in Minnesota and threw in a 2012 trial heat question pitting President Obama against both Tim Pawlenty and Sarah Palin. The result? 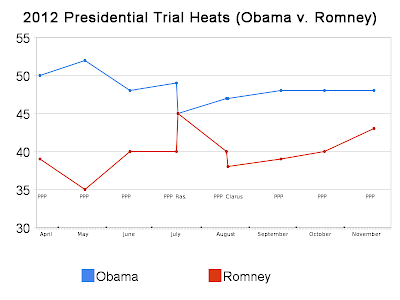 Obama led both, but Pawlenty did the better of the two Republicans in his home state. Obama led the current Minnesota governor 51-40 then. Well, St. 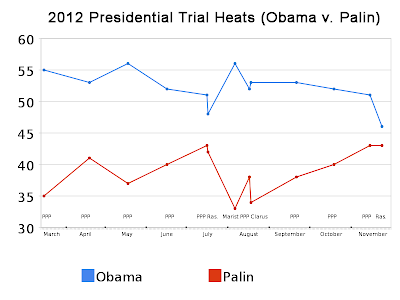 Cloud St. University today released the results of a similar trial heat poll (No, Palin wasn't included. I know, and her book was released today, too!). Did Pawlenty make any headway following his ascension to the Vice Chair position within the Republican Governors Association and the formation of his Freedom First PAC; two events associated with his being on the lips of the punditocracy in relation to the 2012 presidential race? Actually, it doesn't seem to have made all that much difference at all. 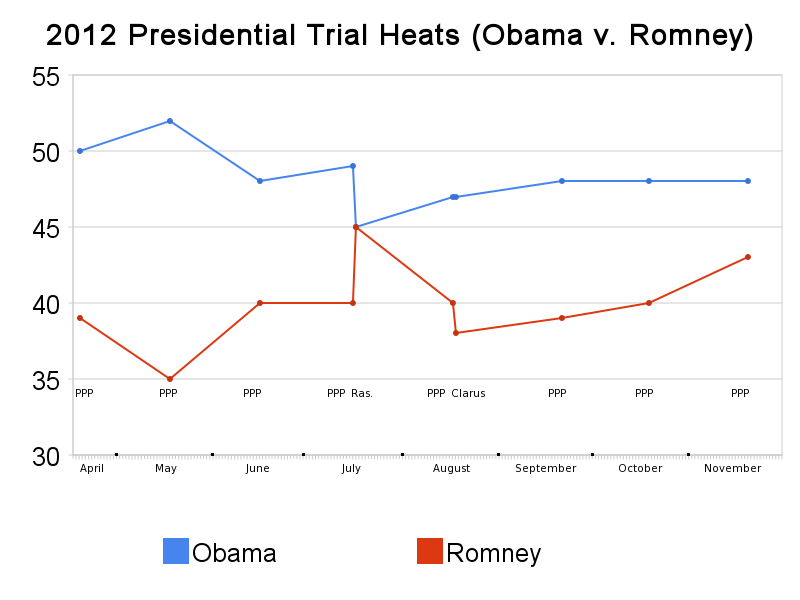 Across two different polling firms' polls, then, Obama dropped some while Pawlenty held steady around the 40% mark. Looking at the margin, this poll isn't any different than the 54-44 edge Obama had over McCain last November in the Land of 10,000 Lakes. In the cross-tabs, there are some interesting nuggets. Obama leads among every age group save the 35-44 group, where Pawlenty leads by 21 points (55-34). 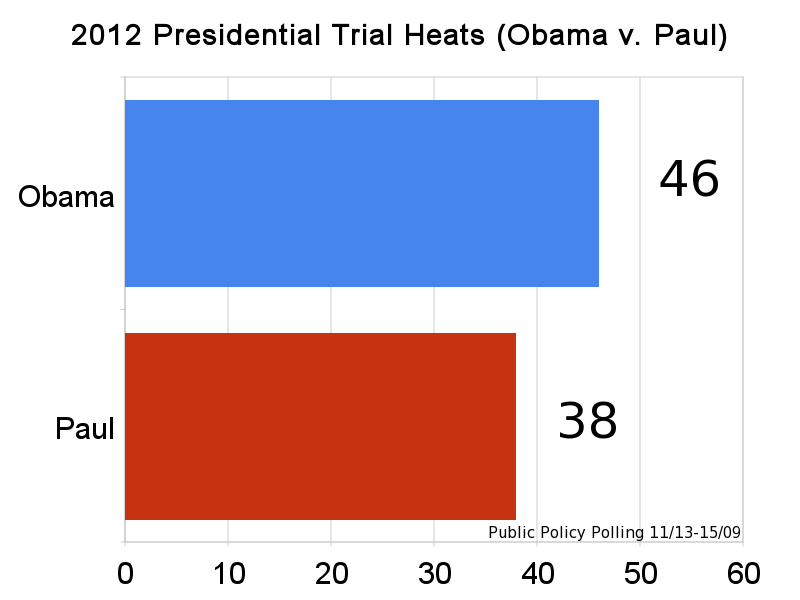 Obama also leads among women (59-31) while trailing among men (49-40). Both candidates(???) have consolidated their bases; each has over 84% among their own partisans. 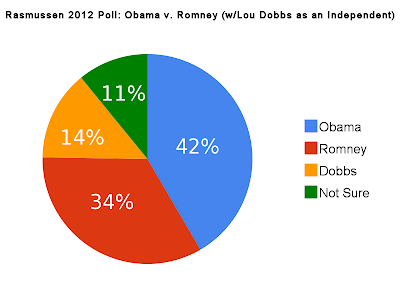 Obama leads among independents (27-17) -- or "those not close to either party." This certainly isn't a trend so much as a flatline, but still, as always, it is nicer to have the data than not. But the bottom line out of this one echoes what FHQ discussed over the weekend: Pawlenty isn't there yet, but he needs to be active to catch up with those potential 2012ers that have more name recognition nationally than he does. 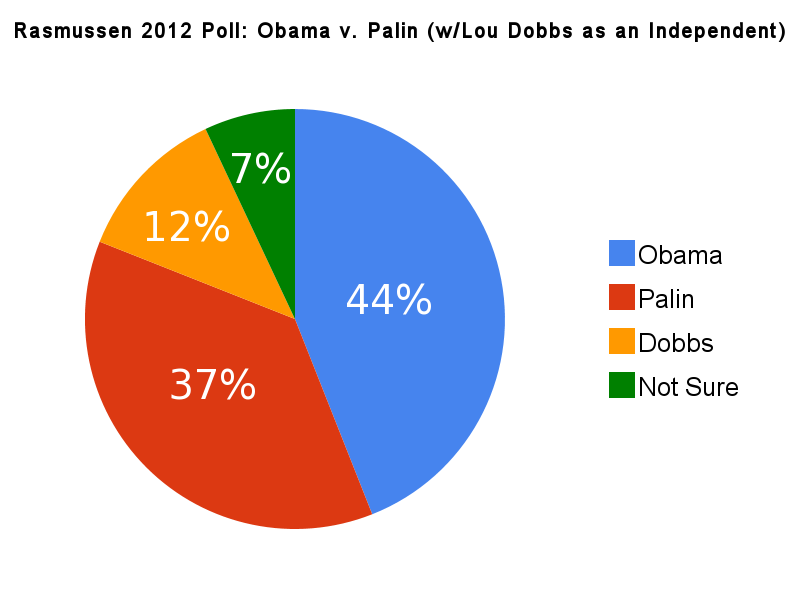 How Palin Could Win the 2012 GOP Nomination. Well, it'll take more than just winner-take-all primaries. This one stuck in FHQ's craw for some reason. As I drove home yesterday and listened to the "How Do You Say 2010?" story on All Things Considered, I became aware of the fact that I was planted rather angrily in one of the camps. Why does this matter? Oh, it doesn't in the grand scheme of things, but since FHQ is in the habit of typing (and saying while I type -- Yes, I'm one of those people.) 2012 quiet a lot and will only see ramped up use of 2010 in the coming month, it is relevant. I'm a Twenty Ten kind of guy. All I could think of while I listened was that George Orwell's book was Nineteen Eighty-Four, not One Thousand Nine Hundred Eighty-Four. All that's happened is that these "Aught" years have broken us of that Nineteen or Twenty habit. Is the Idaho GOP Still After a Closed Primary? One caveat FHQ intended to include in yesterday's glimpse at the Palin Winner-Take-All hypothesis, but neglected to include was the fact that half of the winner-take-all states are not true winner-take-all states. [I think I may have just set the record for number of times using winner-take-all in one sentence.] Thankfully, I have a loyal group of readers/commenters (in this case MysteryPolitico) who are willing to point out these things. This is the power of the blogging platform. Anyway, this is a significant factor in the scenario that Walter Shapiro constructed yesterday. If only 10 of the 21 winner-take-all contests are true, statewide winner-take-all primaries, then Sarah Palin's task of winning the 2012 Republican nomination in that fashion becomes all the more difficult. 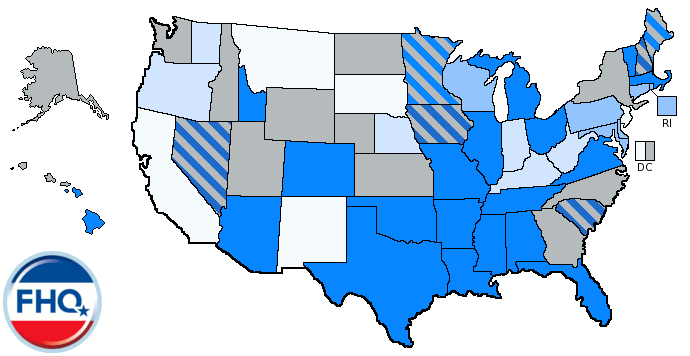 In most of the eleven states that are not true winner-take-all states, the delegate allocation is done at both the congressional district level and statewide level as opposed to simply taking the statewide vote. It would require, in other words, winning some contests within contests to pull off a sweep of a state that allocates delegates in this manner. 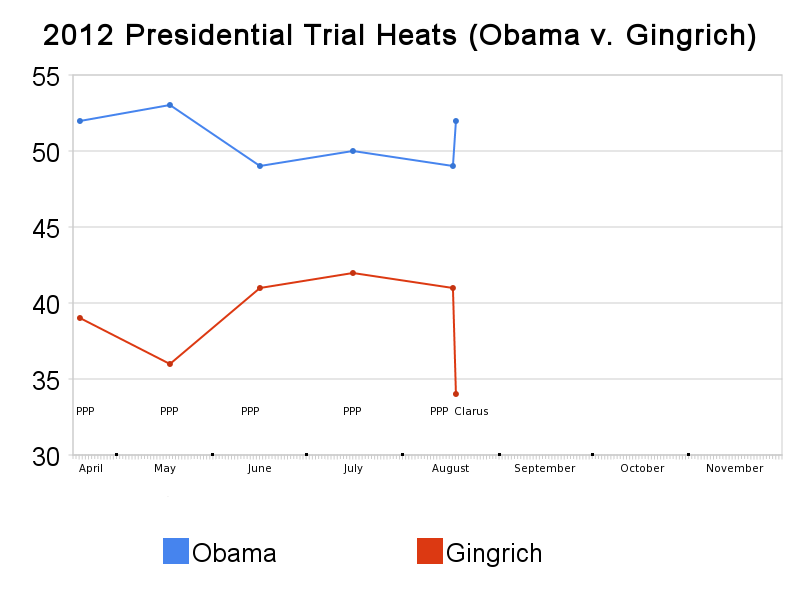 It can happen, but it is tough to pull off in a fragmented nomination race like the 2008 GOP contest. McCain, for instance, was able to win 36% of the vote in Florida and 55% of the vote in Maryland and come out with a sweep of both states' delegates. *Alabama is winner-take-all at the district level and proportional with the at-large delegates at the statewide level. **Indiana allocated approximately half (27 delegates) its delegates under winner-take-all rules by congressional district in its May primary. The remaining delegates were left uncommitted until a June convention where the other half (27 delegates) were allocated in addition to three unpledged, party leaders serving as delegates. Let's look at this in a different way. The eleven states above accounted for 30.9% of the 2008 Republican delegates (777 delegates). Remember, those are the states that are not the true winner-take-all states. The true winner-take-all comprise a paltry 17.8% of the total number of Republican delegates in 2008 (447 delegates). Even if Palin were to sweep those 10 true winner-take-all contests, she would still be faced with likely having to clear 35% in some districts and statewide in those other winner-take-all states. And this doesn't even take into account the proportionally allocated states. Again, if 65% of the Republican primary electorate is against Palin, her path through the Republican rules to the nomination becomes substantially more difficult, winner-take-all rules or not. Pawlenty: Running for 2012, But Will He Be Running in 2012? Walter Shapiro picked an opportune time to point out the fact that Sarah Palin could potentially exploit the Republican Party's presidential nomination rules to win the party's nomination in 2012. As I said a few weeks ago in a response to a post at A Plain Blog About Politics (Palin's Future), those approximately 20 states that have winner-take-all delegate allocation rules could prove to be a real boon to Palin's potential chances. Are these winner-take-all primaries also closed primaries? When are these primaries actually scheduled? On the first point, I think it is fair to say that, given recent polling Palin would do far better in any contest, winner-take-all or otherwise, if it is a contest closed to all but registered Republicans. She just isn't viewed as qualified among independents and Democrats. Now, yes, I'll grant you the fact that some Democrats may choose the "Operation Chaos" route and vote for the Republican with the lowest odds of beating President Obama, but I'm going to set that aside for now. Secondly, timing plays a role here as well. Are all these winner-take-all primaries at the beginning of the process, at the end or fairly evenly distributed across the primary calendar? 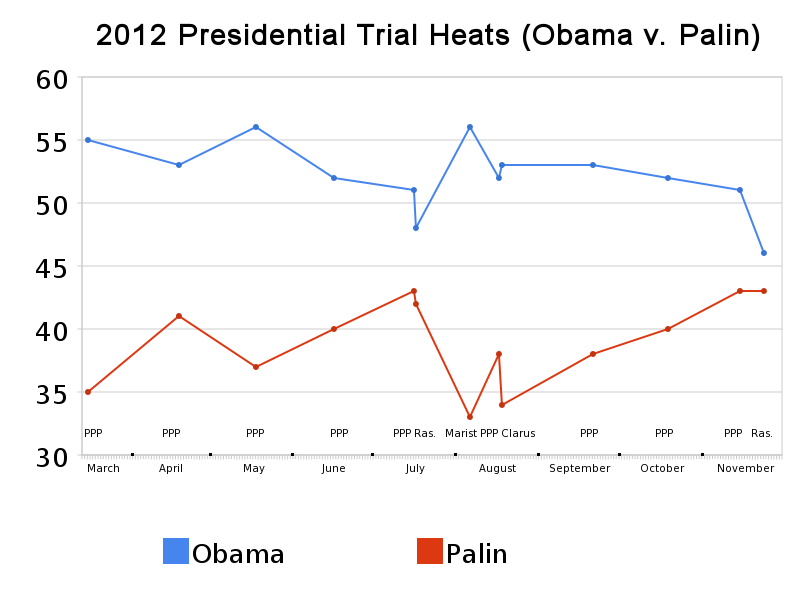 The earlier the better for Palin. If the winner-take-all contests bring up the rear, she likely would be winnowed before the race comes to those states. 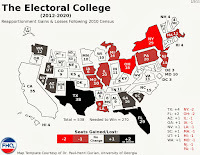 Since the parties are both re-examining how their presidential nominating calendars will look in 2012, there is a fair amount of uncertainty in this. However, based on current state laws across country, the calendar would look something like this if the parties decided to simply maintain the status quo. [The Democrats have already seemingly set into motion a plan to end all February primaries in all but the exempt states -- Iowa, New Hampshire, Nevada and South Carolina.] 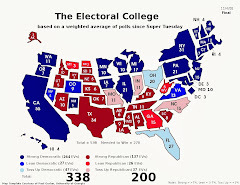 If that calendar is the model, fifteen of the twenty states (plus Washington DC) with winner-take-all contests were on or before Super Tuesday. 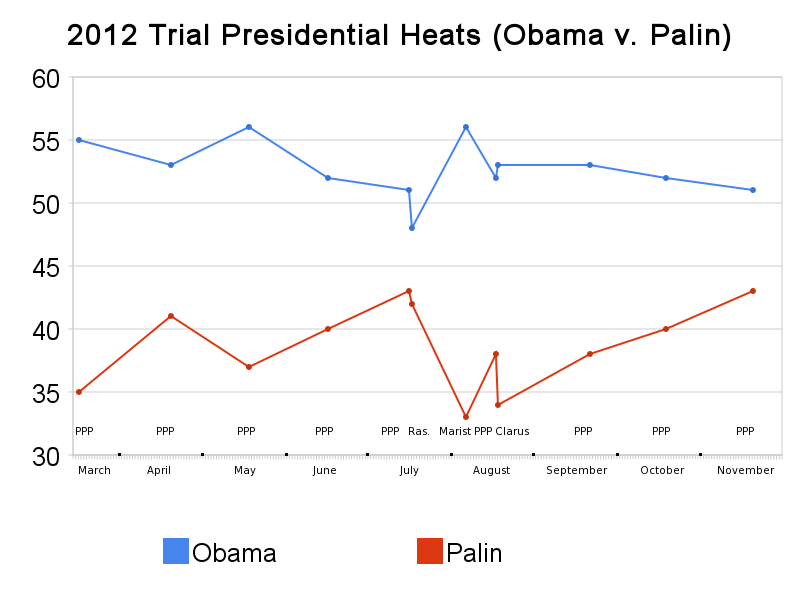 Again, early -- in this hypothesis at least -- is better for Palin than late. *Included with open primaries here are primaries that allow only independents and not, in this case, Democrats to vote. **Assumes no 50% delegate reduction penalty for having gone earlier than that party-designated period for holding contests. Sure, technically, if Palin were to win all of the winner-take-all states, that would almost put her over the top (approximately 49% of the total number of delegates). But if she won all those, it is a safe bet that the former vice presidential nominee would receive an additional 2% of the total delegates in the proportional and loophole primary states to take the nomination. Again though, that is not how the presidential nomination process works. It is very much dependent upon timing and momentum. If you look at those closed primary states above, we're really talking about a more moderate, comparatively speaking, group of states. They are all primary states that McCain won in 2008. But in the context of that race, it was the first closed primary state (Florida) that mattered the most, and not that McCain was a more moderate candidate that appealed to moderate Republicans in closed primary states. It set the tone for the following week, Super Tuesday. And with the exception of Utah, the Arizona senator swept the winner-take-all states and stretched his delegate lead out to a nearly insurmountable margin. 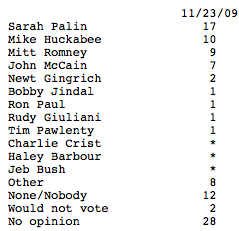 Is there a scenario where Palin wins the Republican nomination? Yeah sure. If she can win Iowa and South Carolina -- eliminating Huckabee (assuming he runs) in the process -- she can attempt to turn whoever is left (especially if it is Mitt Romney and/or Tim Pawlenty) into Dede Scozzafava and the race into an ideological battle that she might be able to win. Of course, if Christian groups are attacking her abortion record, it may be difficult to see that scenario become reality. The bottom line is that Palin would have to catch on in a major way to be able to take advantage of the winner-take-all rules. And honestly that would take quite the populist revolt against the Republican Party and its rules; something that has never happened. [And no, I don't count McCain as an exception to that rule.] As Jonathan Bernstein rightfully points out, if only 35% (as Shapiro indicates) of primary voters support Palin in the Republican primaries, it means that 65% are against her. Again, that would be an epic failure of the Republican rules that are set up to guard against that very thing: an insurgent candidate. Idaho is an open primary state and has never had registration by party. On primary day, any Idaho voter is free to choose any party’s primary ballot. Last year, the Idaho Republican Party filed a federal lawsuit, to force the state to give it a closed primary. But on September 4, 2009, U.S. District Court Judge B. Lynn Winmill ruled that the lawsuit requires a trial to determine whether it is true that voters hostile to the Republican Party have been voting in its primary. The Republican Party then said it would soon reveal its plans on how to proceed. However, the party has not met the informal deadlines for revealing its plans for the trial. The Judge has set a status conference for November 30 to get an updated version of the party’s plans. This sets off a series of questions. Usually, the courts yield to the parties on free association grounds, but it really is interesting to see how much this differs from state to state. In Idaho, the state Republican Party is demanding that the state government -- also dominated by Republican elected officials -- close the state's primaries. As the party argues, open primaries, like the ones held in Idaho for nearly four decades, potentially allow voters from outside the party to influence Republican nominations which by extension negatively impacts the party's freedom of association. What's interesting is that the same argument has been made in courts regarding open primaries. This movement in the courts -- at least on this particular question -- began with the 1986 Tashjian case before the Supreme Court. At issue in that instance was the fact that the Republican Party of Connecticut wanted to open up its primaries -- not close them as in the Idaho case -- but was prevented from doing so because of a Connecticut law, on the books since the 1950s, that kept primaries closed. Well, the Court sided with the Connecticut GOP: the law violated the party's rights to free association; specifically the party's right to invite -- in this case independents -- to vote in its nominating contests. But this is a moving target, isn't it? Some states like Idaho or California have gone in quite the opposite direction. Faced with open primaries, parties in both the Gem state and the Golden state claimed that their free association rights were being threatened by partisans (and non-partisans, for that matter) of the other party. That the parties were unable to determine who would participate in its nominations was something Antonin Scalia, in the 7-2 opinion of the Court in the California Democratic Party v. Jones case, found to be "both severe and unnecessary." That brings up an interesting distinction -- and there are several, actually -- between the California case and the one in Idaho. In California, all the major parties sued to have the blanket primary law invalidated. In Idaho, however, it is just the dominant Republican state party that is attempting to tear down the open primary system. The Democratic Party in Idaho could almost be considered a minor party in the state. And they could care less about the law simply because no or very few Republicans are crossing over to vote in the Democratic primaries. To top it off, the Democrats have often eschewed the primary as a means allocating presidential delegates; instead opting for a closed caucus on the state party's dime. This, however, raises the biggest problem for the Idaho Republican Party in this case: the burden of proof is one the Republican Party. Their argument is that independents and Democrats could have undue influence (read: a moderating influence) on Republican nominations in the state. Proponents of the current open primaries law have simply said, "Prove it." In other words, how have nominations been negatively impacted by the inclusion of Democrats and independents in the process? That's where this Idaho case is currently. It's stuck with the Idaho Republican Party trying to determine the extent to which Democrats and independents have made Republican nominees any less Republican/conservative. If Idaho Republicans want a closed primary or a closed nomination process, they are either going to have to do what the Democrats have done at the presidential level (Though, truth be told, Democrats in Idaho use a caucus as a means of keeping out Republicans and limiting, through a caucus, who participates and decides how delegates are allocated. See Meinke, et al. (2006) for more.) or just deal with it. For now, though, it doesn't look like this particular case is going anywhere. Read more about the Idaho case here and here. If the Minnesota governor follows these numbers (or if they stay the same as 2012 approaches), the answer to that will perhaps be no. 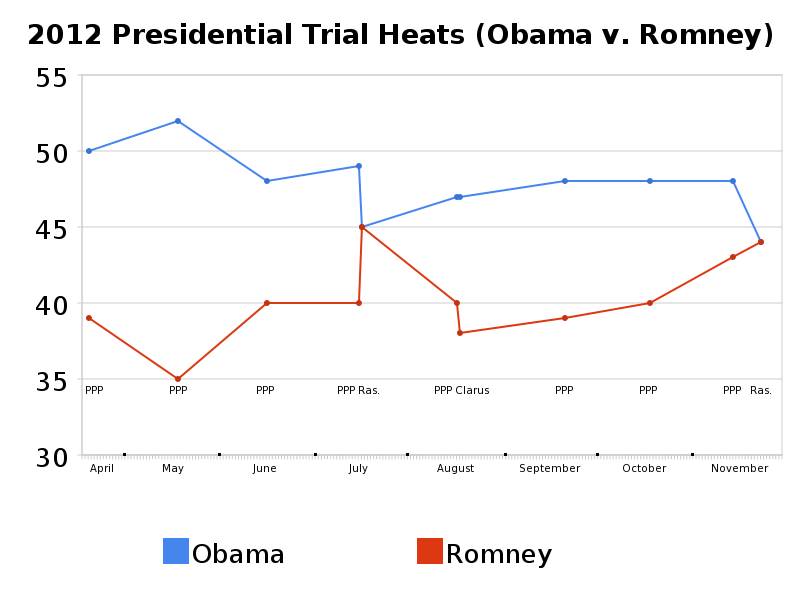 PPP's tweeting about them, Pollster is reporting them, but Rasmussen isn't sharing them. Apparently, somewhere behind the pay wall, Rasmussen is showing in its latest survey of Minnesota that Governor Tim Pawlenty would only have the votes of 42% of Minnesotans if he were to run for president and win the Republican nomination in 2012. 46% would not vote for him. No, that's not necessarily a vote for Obama because the president's name was not used in the question, but it does provide a sense of just how blue Minnesota is. Suppose Governor Tim Pawlenty runs for President in 2012 and wins the Republican nomination. If Pawlenty was the Republican Presidential candidate, would you vote for him? 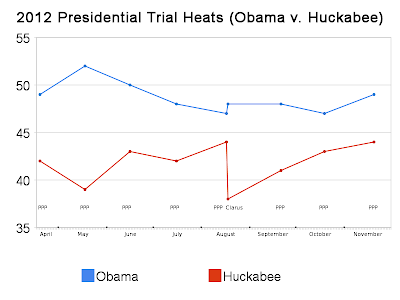 This isn't a true trial heat, but it would have been interesting to have seen how the answers to the two questions (the one above and a head-to-head with Obama) would have differed. My hunch is that the difference would have been similar to the difference between polling an incumbent (for any office) against both an actual named opponent or a generic, unnamed one. Look, for instance, at Sen. Burr's numbers in the latest Public Policy Polling survey of the 2010 race for Senate in North Carolina. Burr performs better against named opposition than against Generic Democrat X and I would assume that Pawlenty's numbers above would decrease if we were talking about a ballot question pitting the Minnesota governor against President Obama. That said, these numbers aren't all that bad. Sure, Tim Pawlenty has the name recognition in his home state that he lacks elsewhere, but in a state where Obama is still garnering higher approval than disapproval numbers -- though that margin has shrunk -- I wouldn't rank this as an awful showing for the governor. Should Tim Pawlenty run for President in 2012? How likely is it that Governor Pawlenty will run for President? 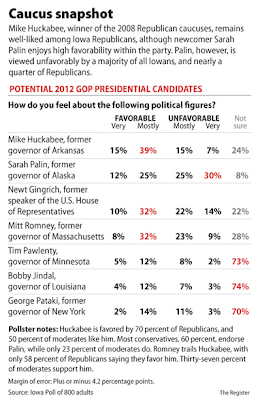 Fine, how likely is it that Governor Pawlenty will win the Republican Presidential nomination in 2012? No, those aren't flattering numbers for someone in their own state, but this is exactly the reason Pawlenty is making the moves he is in relation to 2012 (starting a PAC, traveling the nation, raising money, etc.). 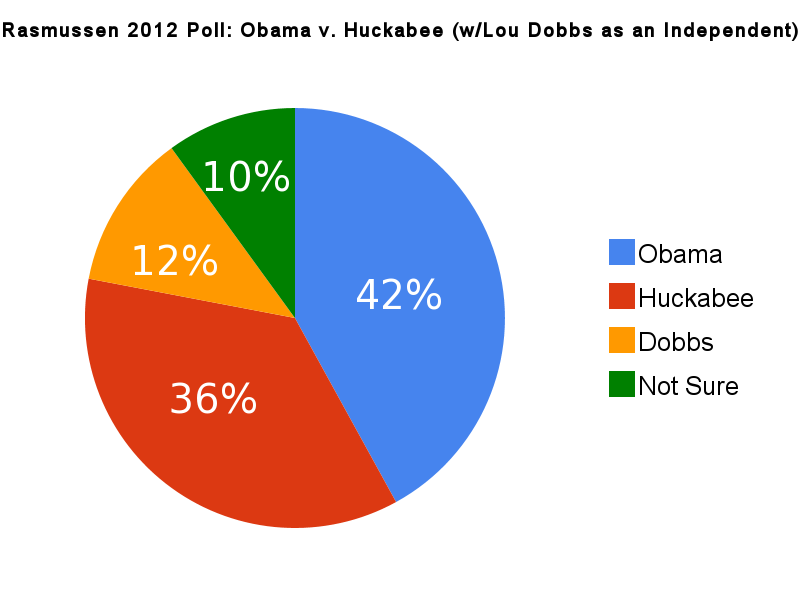 Put simply, he is at a disadvantage relative to the other prospective Republican candidates (Huckabee, Palin and Romney). Do Even "Fairly" Drawn Congressional Districts Favor Republicans? There are so many double entendres in this interview that college students could start a drinking game. * Stormy Daniels could make this an uncomfortable race for David Vitter. No, she won't win, but she'll make a mark whether she enters or not. And I'm still laughing uncontrollably at that Kim Jong-Il line for whatever reason. *Not that FHQ would condone such a thing. For shame. But for a laugh, I recommend reading the rules of the Brent Musberger Drinking Game. FHQ dares college football fans not to laugh heartily. If it's a vote on the internet, Ron Paul wins. One bit of news that made the rounds today is that Minnesota governor, Tim Pawlenty, will be heading up to the Granite state next month to keynote a fund-raiser for the Republican Senate Majority Committee PAC. So what, you might ask? 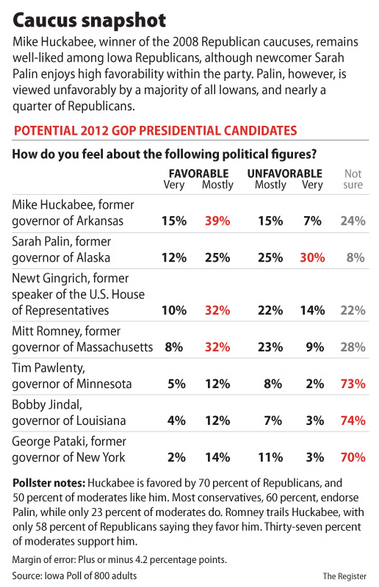 Well, Pawlenty's visit will be the first of the potential 2012 Republicans to make an appearance in New Hampshire. Does that mean Pawlenty is running for president? No, but he is. Pawlenty is running for 2012, but if he is going to run in 2012 has yet to be determined. That, though, isn't why we're here. Sure, it's interesting, but something else is interests FHQ about this visit. It is late. Now, we've recently heard quite a bit of chatter online about Republicans skipping out on Iowa in 2012 because the state's Republican caucusgoers are likely to support a more socially conservative candidate. That's hogwash, and I'll shunt it to the side for the purposes of this discussion. However, what was part and parcel of that argument was the fact that Republican candidates not visiting the Hawkeye state was an indicator of this potential problem. What everyone -- FHQ included -- seemingly failed to check on was whether candidates were making stops in the presidential primary process's other first in the nation state, New Hampshire. However, as I pointed out in the Iowa visits discussion, 2008 may not be the best comparison. Both parties had active nomination and interest in the presidential race was at an unusually fevered pitch earlier than usual. The better comparison, then may be how frequently Democrats were visiting the Granite state in 2001, before the 2004 campaign. Yes, there is a difference in party in that comparison, but the underlying dynamic is the same: incumbent president and one active, out-party nomination race. What does all of this mean? Not that much actually. Well, other than the fact that the prospective 2012 Republican presidential candidates are off to a slower start than the candidates before the 2004 and 2008 elections. Is that a name recognition thing? Romney certainly benefits from having run there before and because of his time spent as governor of neighboring Massachusetts. 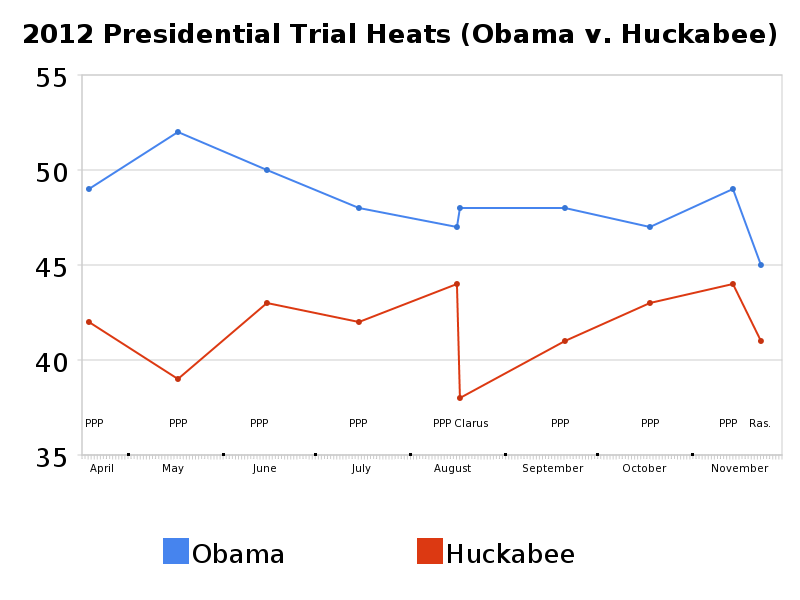 Huckabee, too, has run in the Granite state before. However, his organizational infrastructure there paled in comparison to his Iowa effort in 2008. 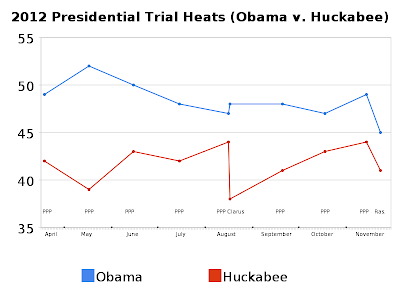 The New Hampshire Huckabee campaign was more ad hoc in nature. And Palin? Well, Sarah Palin is Sarah Palin. People know who she is. But for someone playing catch-up, visiting New Hampshire and Iowa and any other place you can go is likely a shrewd move. For someone like Pawlenty, it never hurts to say you were the first (or more to the point, that you were there early and often). -In his capacity as recruitment chair for the DGA, Gov. Dean met separately with likely Democratic gubernatorial candidates Bev Hollingsworth, Mark Fernald and Jim Normand in Concord, NH on December 19, 2001. Rep. Gephardt visited NH on December 15, 2001; his schedule included events with 1st district congressional candidate Martha Fuller Clark: a brunch at the home of Harlow and Barbara Carpenter in Kensington (SE Rockingham County), a walk-around in Portsmouth, a meeting with New Hampshire Young Democrats and a holiday party "to ring in the New Year and a New Congress!," both at the Millyard Museum in Manchester. On December 6, 2001, Sen. Kerry did a fundraiser for Manchester Democrats in Manchester, NH. On October 26, 2001, Sen. Kerry did a fundraiser for Manchester Mayor Bob Baines in Manchester, NH. Former Vice President Gore headlined the New Hampshire Democratic Party's "Celebrating Our Democracy" Jefferson Jackson Dinner at the Center of New Hampshire Holiday in in Manchester, NH on October 27, 2001; the next day he did a fundraiser at a restaurant for Manchester Mayor Bob Baines. As he had in Iowa, Gore made an unpublicized drive around the state. On the evening of October 22, he joined Sen. Beverly Hollingworth at Lamies in Hampton (Concord Monitor). Early the next morning found him in Berlin, he then headed south for Concord and ended up on the Seacoast, dining with friends and supporters at the Rusty Hammer in Portsmouth (Concord Monitor). Gore left the state on October 24 for Maine, and returned for the speech. (October 22-23 and 27-28). Sen. Kerry keynoted the NH AFL-CIO convention in North Conway and was the special guest at the Merrimack County Democrats Harvest Dinner at Pembroke Academy in NH on October 13, 2001. Rep. Kaptur visited NH on October 13, 2001, speaking at the state's AFL-CIO convention and meeting with campaign finance reform activists. In August 2001, Rev. Al Sharpton announced a freedom bus tour of NH for early October 2001, however that was put off. Sen. Kerry did two events in NH on August 5, 2001, a meet-and-greet for state representative candidate Mary Tetreau at Marilyn Hoffman's house in Londonderry (Kerry revealed his poetic skills, reading a poem of his own composition) and a fundraiser for Manchester Mayor Bob Baines at Donna Soucy's house in Manchester. [Tetreau lost the August 14 special election in a Republican stronghold by less than 300 votes]. Rep. Gephardt made a trip to NH on behalf of state Democrats on June 8-9, 2001. On June 8 he was the featured speaker at the annual Cheshire County Democratic dinner in Keene. On June 9 he appeared, with Gov. Shaheen, at a Rockingham/Strafford County continental breakfast in Portsmouth; the Merrimack County Democrats' Annual Pig Roast & Pot Luck Picnic at the home of Beth Walz and Harry Judd in Bow (again w/ Shaheen); and the Manchester City Democrats' Flag Day Celebration at the Manchester Millyard Museum. Sen. Feingold visited NH on April 23, 2001, in a trip that was primarily focused on appearances in Maine with Sen. Collins. He toured Timberland footwear, met with Gov. Shaheen, and spoke with College Democrats at the University of New Hampshire. Sen. Biden visited Manchester, NH on March 25, 2001 at the invitation of state Sen. Lou D'Allesandro. He spoke at the Manchester Democratic committee's 4th annual St. Patrick's breakfast ($25/plate fundraiser), marched in the St. Patrick's Day parade, and visited the VA Hospital. >Gov. Mitt Romney was a special guest at the Manchester Republican Committee's Annual Holiday Celebration at the Wayfarer Inn in Bedford, NH on the evening of December 7, 2005. >Sen. Bill Frist did several private events in NH on December 6, 2005. Frist met with legislative leaders at the Capitol in Concord; had lunch with the New Hampshire Republican State Committee's executive committee at the law offices of Rath Young and Pignatelli in Concord; visited the Devine Millimet and Branch law firm in Manchester; and attended a reception with several local Republican activists and friends from his days at Harvard Medical School and Mass. General at the 100 Club in Portsmouth. >Gov. George Pataki campaigned with Manchester mayoral candidate Frank Guinta in Manchester, NH on October 23, 2005, going door to door and doing a fundraiser at the home of Sharyn Kelley. >Sen. George Allen visited NH on October 15, 2005. He attended a breakfast fundraiser at the invitation of Oracle PAC at Seedling Cafe in Nashua; spoke at a Stratham Republican Committee reception at the home of Phil ? Anne Caparso in Stratham; and helped kick off the NH Republican State Committee's Founders Program (new major donor program) at the home of Wayne Semprini in New Castle. >Sen. Sam Brownback spoke at the New Hampshire Institute of Politics at Saint Anslem College in Manchester, NH on October 11-12, 2005. On the evening of October 11 he held a town meeting attended by members of the public, faculty and students. On October 12 he gave a guest lecture in an Introduction to Politics class and another class. 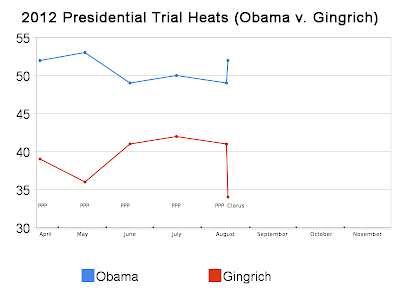 >Former House Speaker Newt Gingrich visited NH on October 7, 2005. Arriving from Vermont he overnighted in Hanover on October 6, then traveled to Concord. Here he met privately with Harry Levine (the co-founder of Victory NH), met with the Republican Alliance (the House conservative caucus), and had lunch in the Speaker's office with the House Speaker, the Governor, the senate President, the deputy Speaker, and Amb. Joseph and Augusta Petrone. Gingrich spoke to legislators and members of the public in Representatives Hall at the State House. While in Concord he stopped by Republican headquarters, the AARP office, and Charlie Bass' congressional office. Proceeding to Manchester, Gingrich spoke to a group of college students at the UNH Manchester campus organized by Prof. Mark Wrighton. >Rep. Tom Tancredo visited NH on September 25-26, 2005. On September 25 he delivered the keynote speech at the New Hampshire Center for Constitutional Studies, Inc.'s 9th Annual Dinner Celebration in honor of Constitution Day at Grappone Center in Concord; and on the morning of September 26 he appeared at the Bedford Republican Committee Annual Breakfast at CR Sparks in Bedford. >Gov. Mitt Romney hosted an afternoon fundraising reception for the New Hampshire Republican State Committee at his home on Lake Winnipesaukee in Wolfeboro, NH on September 17, 2005. >Gov. Mike Huckabee visited NH on August 27, 2005. At the Radisson Center of New Hampshire in Manchester he did a photo op with New Hampshire Young Republicans doing a voter registration drive; attended a NHRSC Issues ? Answers Series breakfast at the Radisson Center of New Hampshire; and did a media roundtable with members of the New Hampshire and Arkansas media. He spoke at the Nashua Republican City Committee's Steak Out at the Alpine Club in Hollis (substituting for Gov. Romney who had bowed out); attended the Strafford County Republican Picnic/Pig Roast at Three River Farm in Dover [speech]; did a book signing at the Barnes ? Noble in Newington; stopped in at the Seacoast Irish Festival at Dover Elks Lodge in Dover; and attended a reception at the home of Turner and Wendy Stanley Jones in Durham. >Gov. Mitt Romney had been scheduled to attend the Nashua Republican City Committee Steakout in Nashua, NH on August 27, 2005 but cancelled a few days before the event citing a family commitment. >Rep. Tom Tancredo visited NH on June 11, 2005. He addressed a NHRSC Issues ? Answers Series breakfast at the Holiday Inn in Concord, delivered the commencement speech at Nashua Christian High School, and spoke at a Nashua City Committee reception at Langdon Place in Nashua. >Sen. George Allen held two fundraisers for his re-election campaign, one at the Bedford Village Inn in Bedford and the other also in the Manchester area, in a quiet trip to NH on May 3, 2005. >Sen. Chuck Hagel visited NH on May 2-4, 2005. On the evening of May 2 he attended the Manchester Republican Committee's Second Annual Springtime Reception at the home of B.J. Perry. On May 3 he spoke to students at the New Hampshire Institute of Politics at Saint Anselm College; stopped to meet with Republican legislators at the State Capitol in Concord; spoke to students at Plymouth State College; and in the evening received an award for "leadership in public communication" from the Franklin Pierce College Marlin Fitzwater Center at the College's Manchester campus. On May 4 he spoke at the "Politics and Eggs" breakfast in Bedford[speech]; spoke to students at New England College in Henniker; and stopped in at the Union Leader. State Sen. Bob Odell (R-Lempster), a longtime acquaintance, helped organize the trip. >Former House Speaker Newt Gingrich visited NH on April 18-19, 2005. On April 18 he did a signing to promote his book "Winning the Future" at the Barnes ? Noble bookstore in Manchester; met with the Concord Monitor ed board; spoke to a Republican grassroots group called Victory New Hampshire > at the New Hampshire Institute of Politics in Goffstown; met with the Manchester Union Leader ed board; taped an interview for New England Cable News; did a fundraising reception for the state party at C.R. Sparks in Bedford; and appeared live on Fox News Channel's "Hannity ? Colmes." On April 19 in Hanover Gingrich did an ed board meeting with the Upper Valley News; did a signing to promote his book at the Dartmouth Bookstore; lectured in Prof. Jeffrey Smith's government class; did an interview with the Dartmouth Review; spoke in the living room at Sigma Alpha Epsilon as part of the Andrew J. Scarlett Lecture Series; and spoke the Upper Valley Republican Club at a lunch at Jesse's Restaurant. He then proceeded to Harvard in Cambridge, MA. >Sen. Sam Brownback spoke at the "True Blue Breakfast" sponsored by the Concord-based Cornerstone Policy Research at the Radisson Center of New Hampshire in Manchester, NH on April 16, 2005. (Note Brownback was in the region to deliver a speech on cloning and stem cell research at the Harvard Law School Society for Law, Life, and Religion spring symposium on April 15). >Sen. Bill Frist spoke at the Merrimack County Lincoln Day Dinner at Grappone Conference Center in Concord, NH on March 18, 2005. On March 19, 2005 he spoke at a Grafton County Republican breakfast at Plymouth Senior Center and a Nashua Republican luncheon at the Crowne Plaza in Nashua. >Sen. Bill Frist delivered the keynote speech at the Manchester Republican Committee Lincoln-Reagan Dinner at The Executive Court Conference Center in Manchester, NH on March 4, 2005. [speech] He spoke at a Cheshire County Breakfast at the Keene Country Club in Keene on March 5, 2005. >Rep. Tom Tancredo, accompanied by Angela "Bay" Buchanan and New Hampshire activist Paul Nagy, visited NH on February 3-4, 2005; the trip focused on immigration reform (Buchanan is chairperson and Tancredo is founding chairman of Team America, a PAC focused on illegal immigration). On February 3 they presented an American Patriot Award to New Ipswich Police Chief Garrett Chamberlain in New Ipswich; stopped for lunch at the Merrimack Restaurant in Manchester; spent a couple of hours at the Union Leader; did a live in-studio radio interview on Gardner Goldsmith's "Against the Grain" show at WGIR-AM in Manchester; and had dinner with conservative leaders at CR Sparks in Bedford. On February 4 they had breakfast with a group of New Hampshire House members; attended a Team America reception held in conjunction with the Nashua Republican Women's Club at a condominium complex in Nashua; and spoke at Nashua Christian High School. They then proceeded to Boston, MA. >Sen. John McCainwas first to venture into NH, albeit briefly; he addressed the second annual Nackey S. Loeb First Amendment Award dinner in Manchester on November 18, 2004. 40 Passes, 39 Used: What's Wrong with This Again?